Inventory We are a resale marketplace, not a box office or venue. Ticket prices may exceed face value. This site is not owned by Fedex Forum . 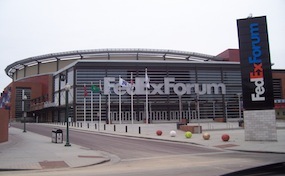 The FedEx Forum opened September 4, 2004 in downtown Memphis on 191 Beale Street. The FedExForum is home to the Nation Basketball Association's Memphis Grizzlies and NCAA's University of Memphis Tigers. The FedEx Forum was built at a total construction cost of $250 million. The FedExForum box office has played host to many big events including the NCAA Tournament, WWE, UFC 107, boxing, concerts, and more. FedEx Forum tickets generally seat a capacity of 18,119 for most basketball games. FedEx Forum was the first venue in the NBA to use the see-through shot clock, allowing spectators to get a better view of the action. The FedEx forum was originally designed by the Ellerbe Becket architectural form. The playing floor was designed to be lower than ground level to give spectators a better view of the events. The interior pays homage to Memphis’s music scene with murals and paintings depicting various instruments and artists. ForumMemphis.com is not a primary ticket supplier or affiliated with any box office. We proudly offer access to all FedEx Forum events at the most competitive prices online. To purchase tickets at anytime simply click the event you wish to attend or call the number above. Prices on our sites tend to be above face value and will change quickly with demand.